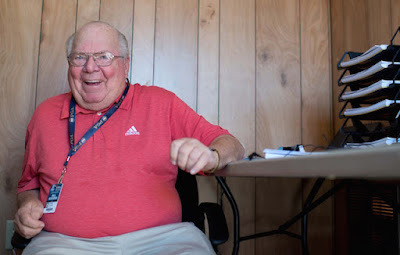 Shirts With Random Triangles: Verne Lundquist To Receive Emmy Lifetime Achievement Award For Sports At 2016 Sports Emmy Awards. College sports followers have been known to express feelings of both love and hate of the 75 year-old and his old-school, down-home style of announcing, but they can't deny his impact on sports broadcasting. During his nearly 50 years in sports broadcasting, he's covered events ranging from The Masters to the SEC Championship Game to the NCAA Men's Basketball Tournament. Notable moments from sports history that Lundquist has covered include Jack Nickalus' fourth and final Masters title in 1986, Christian Laettner's overtime game-winning shot in overtime that helped Duke defeat Kentucky in the 1992 NCAA Men's Basketball Tournament Eastern Regional Final, and the Auburn's last-second victory over Alabama in the 2013 Iron Bowl.